This item can be shipped immediately! High-quality ear muffs with extra soft pads and effective noise reduction. Adjustable in 6 positions, can be turned two ways. (Our shop system will calculate the prices automatically, depending on the quantities. The shipping costs will decrease as order value grows). Use this kit to change the ear pads. Includes: 1 pair of ear pad and a foam inlay. 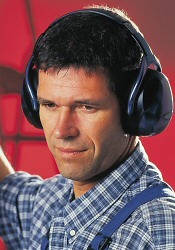 Ear protection is often not worn in places such as the work place because ear muffs fit badly or are too tight. The M1 will put a stop to such practices. 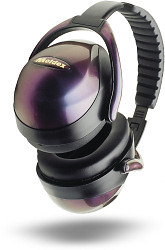 In our opinion, SonicShop offers the best ear muffs for wearing over long periods of time. In making our choice, we have ensured that our 6-point ear muffs have particularly soft pads, which can be replaced if required. If they are used frequently, you can save money by replacing the padding at regular intervals. A high level of noise reduction is only practical if speech can still get through. You will want to understand what is being said to you. The M1 has an extremely high level of noise reduction at 40 decibels between 500 and 8000 Hertz. However, the characteristic line of noise reduction is very straight. The result - the user can understand speech when wearing the M1. What’s more, speech doesn’t sound as muffled as it does with other ear muffs. Solid design, well-conceived articulations and an adjustable metal band to fit over the head ensure you are fully satisfied with your purchase. M1 ear muffs can be adjusted at six different points as required. Besides the two length adjustments on the band, there are 2 settings on either side which optimise the fit over the ears. The cups can even be placed in a slanting position if required. The M1’s large cups allow plenty of space for your ears. The M1 folds compactly together and is quickly tucked away. It is thus ideal for use when making visits to different sites. All soft padding is made of washable synthetic material and can be replaced. The articulations have a solid design and the headband is made of metal. This ensures the ear muffs will last a long time. Ear muffs can also look really good. The M1 wins over with its sleek, dark colours which shimmer in the light with an appealing metallic pearl effect. Too cool for words. © 1997-2018, SonicShop GmbH (operator). All photographs and text are proprietary and/or copyrighted (if not otherwise indicated). Use without prior approval is expressly forbidden and is subject to reimbursement and prosecution. If you would like to use pictures or text, please contact us. Important information: Please research your personal exposure to noise, and obtain professional advice in case of doubt BEFORE using a protective hearing device. Improper use can be harmful to your health. All pictures are non-binding and may deviate from the original product in exceptions. No guaranty is offered for any of the provided information. Technical realisation by SK GrafikDesign. More Links.